The Buntingford is an elegant and comfortable chair with traditional scroll arms and supportive lumbar, with the added benefit of a three tiered fibre filled waterfall back, reversible seat cushions and sprung base. Available in three sizes – petite, standard and king size – and with a range of seat widths and heights. 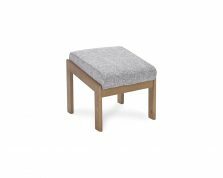 Available in a wide range of quality fabrics and with a choice of wood finish and two leg styles. Also available as a two seater sofa with a choice of seat height.